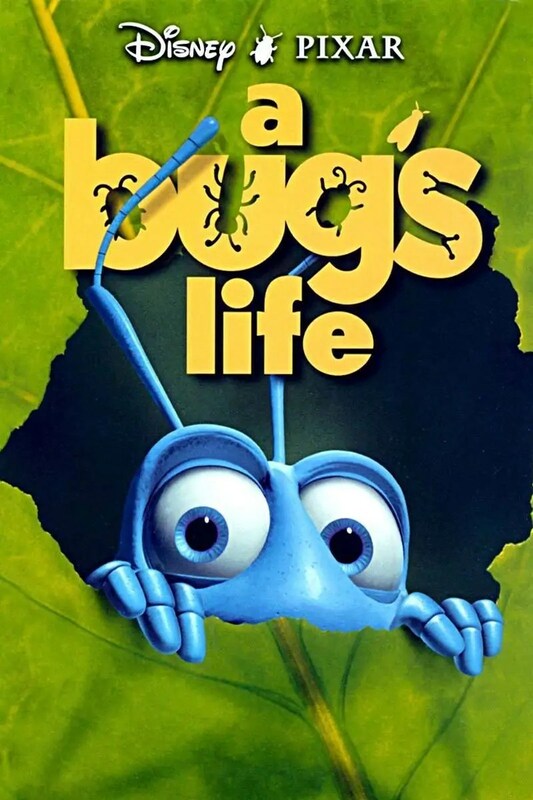 This week’s movie, is another Disney Pixar one, and my husband’s favourite – a bugs life. It’s a great movie, with fantastic animation and attention to detail, and fabulous voice actors. I dearly long for a bugs life 2, I hope they make one, one day! Flik, is a worker ant (and would-be inventor) he, along with the colony of ants are collecting food for the colony’s oppressors, a gang of grasshoppers, led by Hopper. The grasshoppers arrive each season, expecting the ants to have collected food for them, but this season, one of Flik’s inventions goes awry, and all of the food is lost. Whilst the colony wait nervously underground, with their Queen, and Princess Atta (Queen-in-training), they hear how angry Hopper is upon finding that there is no food. All eyes fall to Flik when they realise it is his fault. The gang of Grasshoppers break through the ground and threaten the colony, saying that they will be back and will be wanting twice as much food. A council meeting is called to come up with ways to gather all the food – and for themselves for the winter too. Flik suggests that they go into the big city (a heap of trash under a trailer) and find some warrior bugs to help them defeat Hopper and his gang. The council decide this is a good idea… but only to get Flik out of the way, so they can formulate their own plan. Flik takes off to the big city, and stumbles upon what he believes to be a band of warrior bugs, but are just a troop of circus bugs that have recently been dismissed by their money-hungry ringmaster, P.T. Flea. The bugs in turn, mistake Flik for a talent agent and accept his offer to travel with him back to Ant Island. After they arrive, the circus bugs and Flik both discover their mutual misunderstandings during a welcome performance by the ants. As the circus bugs attempt to leave, the colony is attacked by a bird, which grabs Dot, the baby princess ant. The circus bugs save her and earn the respect of the ants. Flik begs the circus bugs to stay and continue to play the charade of being warrior bugs, and they agree. He then comes up with a plan to build a bird to scare away Hopper and his gang. During the celebration party, P.T. Flea comes looking for his bugs, and the truth comes out. The ant colony become frantic; they exile Flik and he leaves with the circus bugs go and their manager, and the ants try and gather food for Hopper… but there just isn’t enough. The gang take over the colony, demanding their winter food supply. Dot runs off, and overhears some grasshoppers say that they are going to squish the Queen. She catches up with Flik and tells him what is happening, and persuades him, and the circus bugs to come back and help. The 2nd Disney Pixar movie. Won the Broadcast Film Critics Association Awards for Best Animated Film (tied with The Prince of Egypt) and Best Family Film. Was nominated for the Academy Award for Best Original Musical or Comedy Score, the Golden Globe Award for Best Original Score and the BAFTA Award for Best Achievement in Special Visual Effects. The DVD version is first ever all-digital video transfer. The film is a retelling of Aesop’s fable The Ant and the Grasshopper. Is the first Pixar film to have outtakes. Robert De Niro turned down the role of Hopper. In the home video release there were 5 covers to pick from (Hopper, Flick, Dot, Francis, and Heimlich). P.T. Flea’s name was based off of P.T. Barnum, who owned a traveling circus in New York City during the 1840s. Hopper: I swear, if I hadn’t promised Mother on her deathbed that I wouldn’t kill you, I would kill you! Molt: And believe me, no one appreciates that more than I do. Hopper: Shut up! I don’t wanna hear another word out of you while we’re on this island. Do you understand me? Hopper: I said do you understand me? Molt: Well, how can I answer? You said I couldn’t say another word! Hopper: Let this be a lesson to all you ants! Ideas are very dangerous things! You are mindless, soil-shoving losers, put on this Earth to serve us! Flik: You’re wrong, Hopper. Ants are not meant to serve grasshoppers. I’ve seen these ants do great things, and year after year they somehow manage to pick food for themselves *and* you. So-so who is the weaker species? Ants don’t serve grasshoppers! It’s *you* who need *us*! We’re a lot stronger than you say we are… And you know it, don’t you? Tuck & Roll – can’t understand a word they say, but they are hilarious! Fantastic animation and attention to detail – the small world of bugs is so imaginative and fun. The gags – some grown-up humour is thrown into this movie, which goes over kid’s heads, but there for us adults! Heimlich – he’s my favourite bug! The outakes at the end of the movie – they are so funny! Thanks for reading Day 25 of 100 Days of Disney 2015! 75 to go! Come back tomorrow for another Disney post! And if you are a blogger, don’t forget that the 100 Days of Disney – The Blogger Linky is now open!